HOW DO I CHECK AND CHANGE MY PUMP OIL? Use air compressor oil only. Multi-weight automotive engine oils like 10W30 should not be used in air compressors. They leave carbon deposits on critical components that will reduce performance and compressor life. NOTE: Use full synthetic, non-detergent air compressor oil. 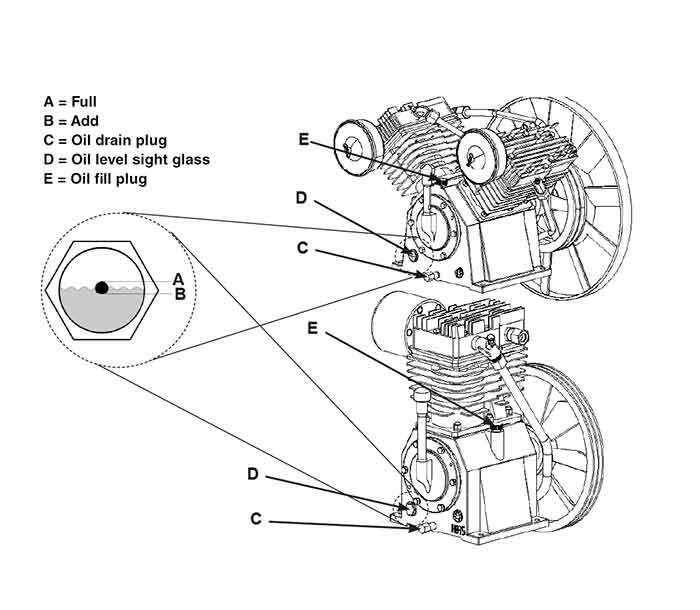 The oil level should be to the middle of the sight glass (D). If needed remove oil fill plug (E) and slowly add oil until it reaches the middle of the sight glass. Remove the oil fill plug (E). Remove the oil drain plug (C) and drain oil into a suitable container. Replace the oil drain plug (C) and tighten securely. Slowly add compressor oil until it reaches the middle of the sight glass (D). NOTE: When filling the crankcase, the oil flows very slowly into the pump. If the oil is added too quickly, it will over flow and appear to be full. CAUTION: Overfilling with oil will cause premature compressor failure. Do not overfill. Replace oil fill plug (E) and tighten securely.